The latest and greatest in skin care therapy. Want to rejuvenate skin, diminish wrinkles and improve tone? Improve skin texture, shrink pores, and diminish scars including acne scarring and stretch marks? Reverse sun damage and pigmentation? Then this medical grade treatment is for you. Our own skin can heal itself by producing collagen fibers and elastin. These work together to keep our skin healthy and supple. 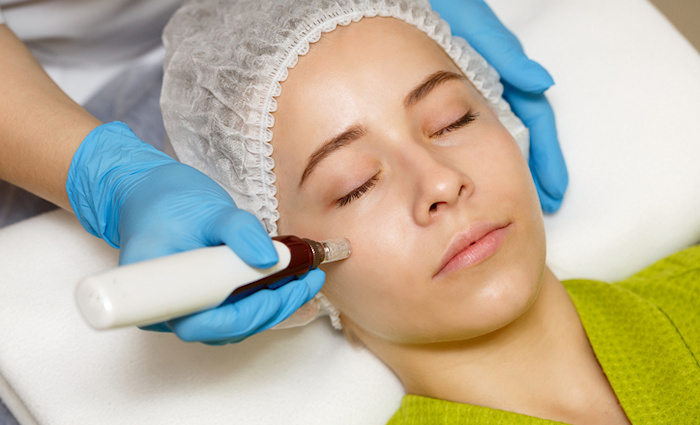 With the InnoPen (Microneedle Therapy System), a precision skin stamping device, our experts create controlled micro injury to the skin to stimulate its natural healing process. The InnoPen is an innovative micro‑needling device that utilizes surgical grade micro‑needles to perforate the skin and allow deeper penetration of skin nutrients, anti‑oxidants and peptides for a powerful anti‑aging effect. Don't worry as we apply a topical numbing cream to help ease any discomfort. Results vary with each individual and you should see optimal results with a series of 6 treatments spaced about 3 ‑ 4 weeks apart. Maintenance is recommended 2 ‑ 3 times per year, but varies with skin type, age and condition. Using professional skincare during treatments and afterwards will launch your results into overdrive. Each treatment also includes a customized exfoliation and masque. The results are amazing.